What you’re picturing can become reality when you hire the right residential architect to make it happen. "I don't think a day goes buy that we don't get up in the morning and think how lucky we are to be living in this beautiful house." This pool is economically kept at 90 degrees year round at a fraction of the usual cost. Building a custom home can be extremely rewarding, but at the outset it can be very intimidating. It will likely be the biggest project — and expense — you will ever undertake. There will be many decisions to make, from layout to building materials to final decorating finishes. That’s why your first decision — choosing the right architect — is the most important decision you will make. It will make the rest of the project easier and more enjoyable. You’ll get expert advice to help you navigate every decision and avoid costly mistakes. "Every step of the way, they helped us understand what was happening and what our options were. They were very good at explaining each option, such as the cost differential and the durability of the different products." With a project as personal and important as building your own home, you will face a multitude of decisions. They are all influenced by a variety of factors, including your budget, size of the project, schedule, location of the property, desired materials and the personal needs of you and your family. All of these factors need to be evaluated to find the right balance that will fit your needs perfectly. But making so many decisions can be stressful, especially when you’ve never built a home before. How will you know if you have all of the facts, or enough knowledge about the long term implications of each choice? Should I spend more money on insulation I’ll never see, or put that money toward higher end kitchen countertops? That’s where Alfandre’s expert architects will help make the whole project easier and less stressful for you. We’ll give you all of the options and discuss the benefits of each with you. The decision will be yours, but we’ll give you our best advice so that in the end, you’ll feel comfortable and assured that you made the right choices. Benefit #1 - You’ll be investing in a better, more sustainable future. At a basic level, “sustainability” means living from today’s resources so that tomorrow’s generations can also live. As human beings, we generally are not living a sustainable lifestyle relative to future generations. At Alfandre Architecture, we would like to find ways to change and even reverse that. That’s why we are committed to constant education about ways to make a building not only sustainable (generating the same energy used and using no more water than needed, etc.) but even restorative (actually improving the environment). We understand that buildings live within the greater context of our community and our planet, and we believe we have a social responsibility to build a better environment for future generations. “We wanted to have minimum impact and maximum use of renewable energy. “My house stays very warm in the winter because it's flooded with sunlight. It stays very cool in the summer because the overhangs shade the windows. It’s a passive solar house, which means that the sun does a lot of the heating of the house. I have solar panels and solar hot water. There's radiant floor heat, and there's also a heat sink which is a huge, concrete slab that heats up during the day when the sun shines in and holds the heat. All my thermostats are set about 10 degrees below what the room temperature is. Benefit #2 - Sustainable design saves you money. It takes some initial investment, but when you build a home using sustainable design principles, it will pay off in multitudes over time. Over the years, you’ll see an increase in savings as you reduce your energy consumption. Everything from the direction your windows face, the type and quantity of windows you choose, the quality and size of the heating and cooling systems to the insulation wrapping your home — all of these variables will affect the temperature of your living space. Your home can be designed and built to maximize the natural heating power of the sun during the winter, while remaining cool and shaded during the summer. Passive solar design, the use of properly designed thermal mass, landscape screening to prevent or facilitate prevailing winds are only some of the techniques that can be employed to reduce your heating and cooling needs. Your home will maintain a consistent, comfortable temperature, and with the addition of renewable energy sources, such as solar electric panels, you can save money on heating and cooling bills with each passing month. Benefit #3 - You have a healthier home for you and your family. Of course, saving money is important, but nothing is more important than the health and well-being of your family. We pay special attention to ensuring that your home will have proper ventilation, adequate sunlight, effective water and moisture management, and comfortable temperatures all year long. It’s not just about comfort. Poor ventilation and lack of water management lead to indoor air pollution caused by mold, mildew, dust mites, etc. — which can cause respiratory problems and long-term health effects. Proper ventilation and consistent, moderate temperatures means the air you breathe in every day will be cleaner and healthier. 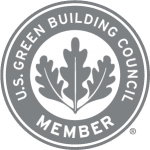 When you use green building materials, you won’t have to worry about the effects of off-gassing — the release of toxic airborne chemicals or volatile organic compounds (VOCs) from building materials — which have been shown to cause allergic reactions, asthma attacks, headaches, and many other health issues. Triple glazed windows bring in the morning sun in this Energy Star home in Gardiner, NY. When you decide to hire us for both design & build, the whole project runs as smoothly and efficiently as possible. Because we offer both architectural and build services under one roof, if you wish, you can have your entire project managed by one team, from start to finish. We do not require that you hire us to construct your building, but the process is much more seamless if you do. Managing both the design and build process allows us to increase speed and reduce costs while maintaining and even increasing the quality of the results. And best of all, you won’t need to worry about dealing with miscommunication between the architect and the builder — which means a stress-free experience for you! “When it came time to put the hammer and nail and boards together, we didn't waste any time having to translate what was going to happen [between architect and builder]. Joe Beglino, the contractor for Eco-Builders, was at every meeting from the beginning. By the time we actually started to build, he already had sub-contractors lined up. He was ready to go from the day we signed the contract. If Joe had questions about the design concept, he was close enough to Rick to be able to ask those questions without going through any formal process, back and forth, between builder and architect … or standing in a field with plans and saying, 'I wonder what the hell he had in mind when he drew this corner?" We will strive to understand your family’s unique needs and design your new home to make your life better, easier, and more comfortable. We will design and build a home of long-lasting quality and beauty that will fit in seamlessly with its surroundings and be uniquely customized to your lifestyle. We will give you all of the information you need to make informed decisions. And we will guide you on how to invest in your home for the greatest impact and long-term benefits. we are not the right team for you. ... Then you can’t afford not to hire us. The initial investment may be more than what you’ll pay with an architect or builder competing primarily on price, but the long-term benefits and savings will serve you and your family immeasurably better. Let’s discuss your goals for building your new home. Then, we’ll give you our best advice on how to move forward on your project.